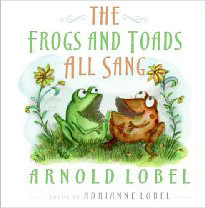 This book is based on a discovered treasure -- a little handmade book that Arnold Lobel had given to Crosby Bonsall as a Christmas gift long ago. The book was black and white, so for this delightful picture book version, his own daughter filled in the drawings with color. There's nothing profound or tremendously significant here. But somehow, the poems beg to be read aloud. And when you finish reading the book, I am quite sure you will be smiling.